Stressed kids (and parents too…) back to school? Are your kids worried about back to school time or are you stressed that this time of year there is so much to do? Between sports schedules, school starting and the upcoming test anxiety, sometimes it can all lead to being a little stressed out. There are many options for overcoming the level of stress you or your child may experience. 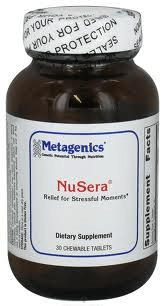 NuSera®,from Metagenics, is a chocolate-flavored chewable tablet specially formulated to help people feel calm and relaxed during occasional stressful moments. 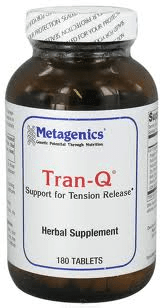 In times of chronic stress and worry, along with tightness in the upper shoulders, neck and commonly headaches, Metagenics has TranQ® for you. Feeling a little wired and stressed to the max? Serenegen®, from Metagenics has been formulated to help your mind and body relax a little better and not feel so edgy. 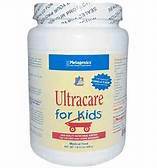 The common question next is, how can I give this supplement to my child? The Nusera is a chocolate, tasty chewable so there should be no problem there for even kids ages 2-3 and older. The TranQ is about the size of a pea, so have your kids try and swallow a pea first (no fear of lodging in the throat!). If they can do that, then they have pill swallowing down!! Usually the ages of 4 and above can do this trick pretty well. If that still doesn’t work, the tablets could be ground up in a morning smoothie and entirely hidden from taste or size. Also to help keep stress down, it is important to get your chiropractic adjustment! Getting your nervous system tuned up can help balance the stress and help in relaxation. Too often in our society, we are in a flight or fight stress response, and getting adjusted in specific regions of the spine can help balance this to calm down. All ages can benefit from this, from newborn to the very elderly. We just had a 9 week old in the clinic this week that mom described as ‘just not relaxed, very stiff and crabby’ and stated after one adjustment he just ‘seemed so much more calm,’ which is much easier on the whole family! And lastly, it is very important to start your day and your child’s day off with a good breakfast. Make sure to get some protein; eggs (hard-boiled for on the go, or cooked in any way you like), protein waffles or pancakes, or granola and yogurt. Eating almost any of the cold cereal options are loaded with sugar and will only lead to more stress in the body and mind. Even in the least, if you get a good balanced protein shake going in the morning for right away in the car or for later in the morning (often a complaint from adults, they ‘just aren’t hungry’…which is a whole other story for another time!). As always, give a call or stop in, we will try to help you best we can to get a good start to the school year for you and the kids! We have many options available from supplements to essential oils to help beyond the ideas listed here. We are here to help! *At the clinic we have a Identity Stress Questionnaire to fill out if you are unsure of which formula may benefit you or your child the best. Call today to schedule your tune up or find which supplementation may be best for you!